The UN Secretary-General said he was “gravely concerned” by the firing of a rocket from Gaza deep into Israel on Monday which reportedly injured seven people, including three children, north of the capital Tel Aviv. He also noted the reports of Israeli fire directed towards Gaza in response, saying that the UN chief was “monitoring events” closely. According to news reports, Israeli forces said they had carried out strikes against what were described as Hamas targets, and Gaza’s health ministry reported that seven had been injured during the retaliatory air strikes. The extremist group Hamas has controlled the Gaza Strip since 2006, but so far, no group has claimed responsibility for launching the rocket on Monday morning, according to latest media reports, which penetrated further into Israel than any attack since the end of the most recent conflict between Israel and Gaza, in 2014. “We continue to work with Egypt and all concerned parties to try to de-escalate the situation and again, encourage restraint” said Mr. Dujarric. 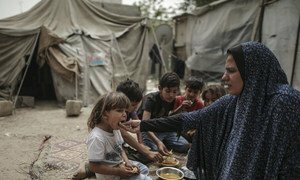 “Further escalation is likely to make an already bad situation worse, in particular for civilians in and close to Gaza,” he added. 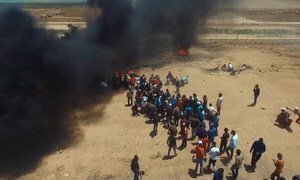 Human Rights Council-appointed investigators urged Israel on Monday to revise its military rules of engagement, shortly before the one-year anniversary of the start of mass demonstrations at the country’s border fence with Gaza, that have left hundreds of Palestinians dead and thousands more injured.